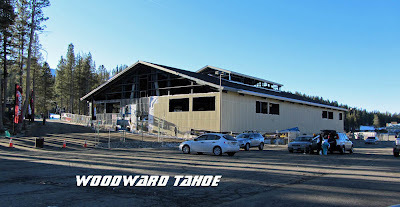 Woodward Tahoe, that big new 33,000 square foot building in Boreal’s parking lot, is an action sports training facility. Woodward began business June 10 of this year, when it began private summer “camps”. Summer camp is over, so now Woodward Tahoe is open to the public 7 days a week. Anyone over the age of 7 who is interested in action sports and wants to improve their skills can come take advantage of the indoor and outdoor facilities. The outdoor facilities will close when the snow falls, but the indoor equipment and tracks will remain open until April 14, 2013. There are a variety of passes and tickets to get you in the door. Once you take a Basic Training course on an apparatus, you are allowed to use it freely. The foam pits allow you to try aerial hijinks without getting hurt. Bunker Pass: $279. Full access 7 days a week from 11:00am to 8:00pm until April 14, 2013. Core Membership: One-time fee of $49 and pay $25 per 2-hour session. For additional pricing, visit the Woodward Tahoe pricing page.